Mrs. Mallika Srinivasan is the CEO of TAFE [Tractors and Farm Equipment] and is one of the most successful women CEOs in India having transformed TAFE from a 80-crore company to a 2500-crore market leader. She was awarded the Business Woman of the Year Award by the BBC, UK in 1999 and the Economic Times Business Woman of the Year in 2006. Engaged in many social service activities, she is also an active participant in the Mother and Child Care programme undertaken by the Easwaramma Women’s Welfare Trust. 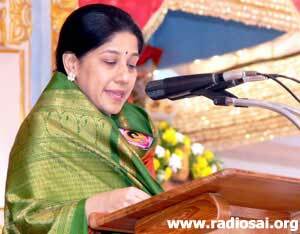 This is the transcript of the talk she delivered to the delegates of the Sri Sathya Sai World Youth Conference during a workshop session in Prasanthi Nilayam on July 26, 2007. I offer my most loving and humble pranams at the lotus feet of our Beloved Bhagavan. Respected elders, Sai youth, brothers and sisters, Sairam to all of you. Each one of us gathered here today is truly blessed, enjoying and basking as we do in Bhagavan’s Protection, Grace and Love. 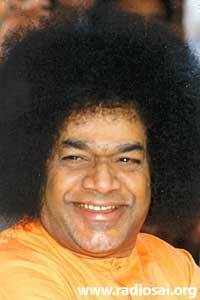 To my family, as to all of you, Swami has been the very centre of existence - mother, father, guru and God. All of you as Sai Youth are exceptionally privileged. For unlike people like myself, who went through a process that began with magnetic attraction, led to intellectual curiosity, and perhaps a degree of scepticism before the spark of devotion could be lit, leading to faith and finally to total surrender, you have been brought into Swami’s fold at a time when your heart is open to receive His love instantly. Youth take to Swami like fish to water. It is the determination of Swami to sow in the minds of young people which are like rays of the rising sun, the seeds of desire for acquiring spiritual knowledge. These seeds have already been sown in the Sai Youth gathered here today. 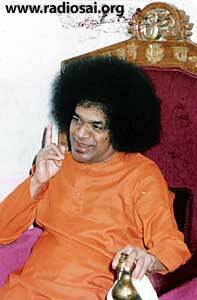 The distinguishing feature of Sai Youth is that material gains are not the sole goal of your lives. You seek to lead holistic lives, yearn to achieve a larger purpose and strive to be better human beings. Living in the presence of Bhagavan offers us the very best opportunity to achieve this. Swami teaches us in a variety of ways through His compassion, through disciplining, through His interactions, through the formal teaching like we had this morning, and at times through direct advice: “Watch, observe, learn, obey and apply.” Then, we will begin to comprehend the essence of what is required for a successful life, i.e., the building of character. Devotion, Duty, Discipline, Determination and Discrimination are the pillars on which the robust house of character is built. These are the few things I would like to touch upon today. Devotion to God is fundamental to leading a virtuous life. Swami, through His Divine Love and in His own inimitable way, evokes in each of our hearts, this devotion and builds our faith. I would like to share with you, one such instance, when Swami through a simple and appealing example captured the heart of a young boy in an instant, making him a devotee for life! During an interview, Swami asked our young son to ask Him a question. Swami gave a lovely smile and answered, “Morris Minor” and went on to tell stories of how He used to drive to Madras and how He obtained a license. “You used to drive it yourself Swami?” Exclaimed the boy, stars in His eyes! Swami had woven a bit of magic and our son looked at Swami transfixed. Duty without expectation of reward is the essence of the Bhagavad Gita. Let us cast a glimpse of what is actually happening around us in the world today, especially in the lives of younger people. There is, if you permit me to say, an obsession with being remunerated; with obtaining greater and greater power and authority. There is a constant measurement of work versus reward and a continuous comparison with other family members, friends, colleagues and peers. Opportunities and temptations abound in a growing economy and this is fuelling these trends. Frequency of job change has reached new heights and as the search continues for something elusive, our inner peace is destroyed. If, on the other hand, we enjoy doing what we are doing, do our very best, excel at it, going beyond what is commonly termed “the call of duty,” do our tasks with devotion and love, without fear of failure, leaving the rewards to Swami, not only will we achieve inner peace, but we will exceed our own expectations of performance. In our professional lives, we may have the illusion that we control outcomes. That it is only an illusion becomes quite clear, when we are faced with a personal crisis. For example, let us take the illness of a loved one. My mother, a very healthy person, was recently diagnosed with having an ailment, for which the prognosis was indeed poor. Only God could save her. It is in situations like this, that faith and surrender make us witness Swami’s magic. His Grace fills us with a sense of calm. He directs and guides us to do our duty taking appropriate decisions and leaving the rest to Him. It is Bhagavan’s infinite grace that she is today completely well, truly Swami’s walking miracle. Faith enables us to carry out our duties calmly, even under extraordinarily extenuating circumstances, surrendering the problem at His feet. Our duty, however, extends beyond our jobs and serving our families to serving humanity at large. Speaking at the Harvard Commencement in June 2007, Bill Gates said, “When you consider what those of us here have been given in talent, privilege and opportunity, there is almost no limit to what the world has a right to expect from us.” We gathered here today, are even more privileged than those in Harvard. For, we have in our midst, Bhagavan, to teach and guide us as we strive to give back to society, what society has given to us! “We make a living by what we get, we make a life by what we give,” said Winston Churchill. While our ancient texts have laid down the way wealth should be distributed, a quarter for personal use, a quarter for charitable purposes, a quarter on other living beings, and a quarter in support of state, even in this materialistic world, there are a handful of the richest of men, who have set outstanding examples of giving back to serve the larger cause of humanity. Many of you would probably have read Warren Buffet’s recent announcement that he would donate 85% of his 44 billion dollar empire to charity to serve communities across the world and most importantly, without heed to religion, caste or community. Inspired by such examples, Sai Youth, having imbibed Swami's teachings of “Service to man is service to God” can play a prominent role in the establishment of a new world order. 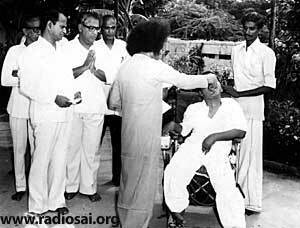 Participating actively in Swami’s Seva Organization and programs, be they providing water, food or medical care, gives Sai Youth a unique opportunity to serve with love under Divine Guidance. How Can ‘I’ Start Service? Opportunities to serve are everywhere; one does not have to search for them. They are in your neighbourhood and in your work place. As Swami says, you may not get a chance to participate in some gigantic scheme of service through which millions may be benefited, but you can lift a lame lamb over the side, or lead a blind child across a busy road. That too is an act of worship. If you look around you with love, service to others will come spontaneously and become an intrinsic part of our daily lives. In the words of Bhagavan, the real value of seva and its most visible result is that it transforms and reshapes you. 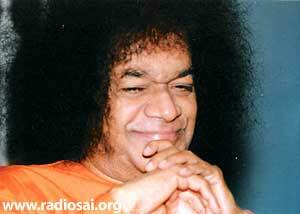 Devotion must be directed along the lines of duty and tested in the crucible of discipline, says Bhagavan. 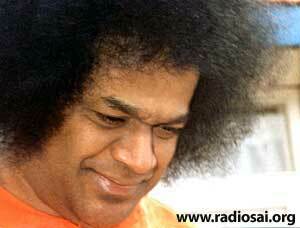 “Why do we need discipline?” Swami’s analogy comparing life to a football game, gives us the answer. If any player can do anything with the ball, and there is neither foul nor out, neither offside nor goal, neither throw nor penalty, then it be a meaningless game incapable of giving joy. It is these rules and restrictions that give charm to the game of life. It is disciplined societies that emerge victorious. Japan was decimated during World War II and Korea sank into poverty after the Korean War. It is discipline that has enabled the resurgence of both Japan and South Korea that has enabled both these countries and propelled them into being economic power houses. Discipline pervades every aspect of life in their society. Their daily routine, their work habits, their interaction with each other, and everything is done in a particular way at a particular time and with no deviations. In Japan, even the tea ceremony is a much disciplined affair. Quality, efficiency and excellence in everything they do are the hallmarks of these societies. It is individual discipline that translates into this kind of societal discipline and ensures success. While discipline is a prerequisite in every endeavour, be it social, economic or material, it is even more vital for Sai youth aspiring to pursue the spiritual path. Swami expects the highest levels of discipline from his students and the youth, for it is this discipline that builds credibility, the foundation stone for leadership. When a new employee joins a firm, both his seniors and his subordinates are watching him closely. Does he come to work on time? Does he do what he says he will? Does he deliver his assigned tasks on schedule? Is there unison in what he thinks, says and does? Is he willing to shoulder additional responsibilities? No one can succeed in his or her mission alone, and success depends upon the support we are able to garner from others and this support is garnered only through credibility established by the practice of personal discipline. People may not believe what you say. But they will surely believe what they see you do. Emerson, the American author had this to say. “What you are shouts so loudly in my ears that I cannot hear what you say.” It is character that communicates most eloquently. Determination is widely acclaimed as the king of faculties and as the one that succeeds when everything else fails. Nothing can take the place of persistence. Talent will not. Nothing is more common than unsuccessful men with great talent. Genius will not. Nothing is more common than unrewarded genius! It is now almost like a proverb. Education will not. The world is full of educated derelicts. Persistence and determination alone are omnipotent. A distinction however may be made, between determination and obstinacy. An obstinate man is not open to suggestions and course corrections become impossible. In sharp contrast, a determined man has a flexible approach, keeps his eye on the goal post and freely takes inputs that help to further progress towards the goal. Obstinate people are filled with ego. Determination without a trace of ego or self-interest empowers the individual with a sharper sense of discrimination. Discrimination is the ability to distinguish between good and bad, right and wrong, and take the correct decision, given a specific set of circumstances. What is right in one situation may not be right in another and leaders are often faced with difficult choices. But in every situation, discrimination implies applying the principle of dharma, the righteousness that upholds the universe. A couple of examples. Each one of us has different roles that we play in life. The father at home is many times the boss at work, be it a small, medium, or large business. The factors that he takes when taking a decision vis-à-vis his son in his role as a father will be distinctively different from those that he uses when taking decisions at the work place. At the work place, he cannot take decisions based only on his son’s individual interest. For, these affect the larger good of the Organization. Therefore, necessarily, it has to be above self-interest. He needs to give up on mine and thine. Hitler was a determined man. Why was he destroyed? His determination was filled with ego and megalomaniac tendencies. The larger good was not in sight. He lost his discrimination for his decisions were not based on the principles of Dharma. While the Dharma for each person may be different, depending upon the role he plays, the basic principles of dharma, based on which discrimination is applied remain unchanged, namely, truth, love, fortitude and non-violence. These are the cornerstones of the practice of Dharma and upholding Dharma is the insignia of a true leader. When there is Dharma, there is victory. And the protector of Dharma, will always be protected by Bhagavan. Devotion, Duty, Discipline, Determination and Discrimination are integral parts of the whole and need to come together in perfect balance to form the character of an ideal Sai Youth.